As I strolled up the ridges along the Old Gardiner Road on my hike today, peering over hilltops at each new vista, it forcibly struck me how foreign this wondrous landscape is to me. After exploring Yosemite for over twenty years, I intimately knew and loved the landscape--I knew the crackle of the rough granite soil under my feet, the names of the peaks and lakes I passed, the shape and color of the alpine basins, even the tenor of the voice of the mountain wind. In Yellowstone, I am a stranger just becoming acquainted with the land and its language; a foreign traveler trying to decipher the customs and culture of a wild country. I miss the Sierra landscape, but I am also excited about developing a "friendship" with Yellowstone. One aspect of this friendship that will definitely take getting used to is the wildlife encounters. In all of my wanderings in the Sierra, I encountered maybe a dozen bears, numerous mule deer, a plethora of marmots, and the occasional coyote. Yet observing large mammals in Yosemite was certainly more the exception rather than the rule. My backcountry, off-trail explorations contain much more of an element of regular surprise here in Yellowstone. Today when I crested a ridge, I suddenly stood before three large elk. 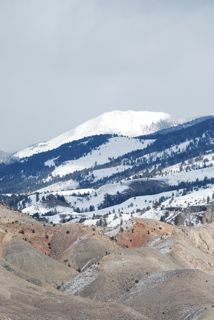 Early spring has arrived in the park; tomorrow the plow crews begin clearing park roads. Even the animals appear more animated and frisky. The elk and bison conserved every ounce of precious energy in the deep winter, but I have observed them playfully trotting and running this weekend. The advent of the spring thaw will also reveal a new park to me as Yellowstone has been sleeping under snow since I arrived.